Last week we looked at some Christmastime episodes of daytime dramas (aka soap operas) of the 1960s. This week, we're going back a bit further, to the 1950s. First is a very rare color video of CBS's Playhouse 90 broadcast of "The Nutcracker," shown on December 25, 1958. It's the famed version choreographed by the legendary George Balanchine, one made famous by the New York City Ballet. Balanchine himself appears as Herr Drosselmeyer, with the great Edward Villella, Bonnie Bedelia, and (an unnecessary) narration by June Lockhart. This is one of the first-ever television broadcasts of "The Nutcracker," and the first in color. The second is also from CBS. 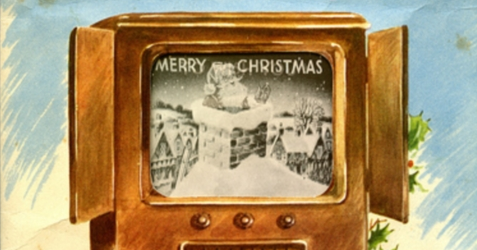 Broadcast on December 23, 1956 it's the repeat of the 1955 telecast of G.E. Theater's "A Child is Born." You might recognize the longtime host of G.E. Theater: Ronald Reagan, here appearing with Nancy and Maureen. Was the CBS "Nutcracker" a color tape, a color kinescope, or on color film? Thew color quality doesn't look all that good. The NBC version seems to be a color tape.